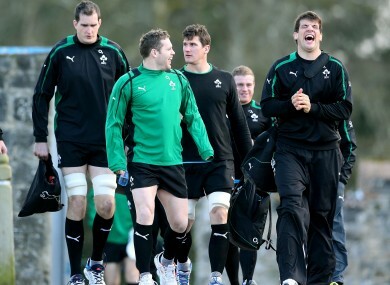 Darren Cave and Donncha O'Callaghan share a joke on the way to training this week. One to watch: There’s plenty but we might as well see how this 6 Nations campaign ends for Ireland. One to Sky+: There’s a tasty double header of Gaelic football tomorrow evening. I’ll be pressing my white John Travolta suit and heading for town. One to skip: Some of us can’t afford to watch any more racing this week. Basketball: NBA, Indiana Pacers v Los Angeles Lakers, (ESPN, 11pm). Cricket: ODI, South Africa v Pakistan, (Sky Sports 1, noon); Test, New Zealand v England, (Sky Sports 1, 9pm); India v Australia, (Sky Sports 3, 3.55am, Sat). Golf: European Tour, Avantha Masters, (Sky Sports 2, 8am); PGA Tour, Tampa Bay Championship, (Sky Sports 3, 7pm). Horse racing: Cheltenham Festival, (RTÉ Two, 1.25pm, Channel 4, 12.35pm, Setanta Sports Ireland, 1pm). Motor sport: Formula One, Australian Grand Prix, (Setanta Sports Ireland, 2.55am, Sat and 5.45am, Sat). Rugby: Super 15, Highlanders v Hurricanes and Waratahs v Cheetahs, (Sky Sports 3 from 6.30am), Kings v Chiefs, (Sky Sports 4, 5.10pm). Football: Champions League and Europa League quarter-finals/semi-finals draw, (Sky Sports/Eurosport, 11am); Airtricity league, Shamrock Rovers v St Patrick’s Athletic, (RTÉ Two, 7.30pm); Clydesdale Bank Premier League, Motherwell v Hibernian, (ESPN, 7.15pm); Ligue 1, Marseille v Ajaccio, (Setanta Sports Ireland, 7.15pm). Cricket: Test, West Indies v Zimbabwe, (Sky Sports 1, 1.55pm); New Zealand v England, (Sky Sports 1, 9pm); India v Australia, (Sky Sports 2, 3.55am). Golf: European Tour, Avantha Masters, (Sky Sports 1, 6.30am); PGA Tour, Tampa Bay Championship, (Sky Sports 3, 5pm). Horse racing: Channel 4 Racing, (Channel 4, 1.45pm). Motor sport: Formula One, Australian Grand Prix, (Setanta Sports Ireland, 5.55am). Rugby: RBS 6 Nations, Italy v Ireland, (RTÉ Two, 2pm, BBC1, 2.05pm), Wales v England, (BBC1, 4.30pm), France v Scotland, (BBC2, 7.30pm); Super 15, Crusaders v Bulls and Reds v Western Force, (Sky Sports 4 from 6.30am); Sharks v Brumbies, (Sky Sports 4, 3pm). Football: Premier League, Everton v Manchester City, (Sky Sports 2, noon), Manchester United v Reading, (ESPN, 4.30pm); Premier soccer Saturday, (RTÉ Two, 10.15pm); Irn Bru Third Division, Elgin City v Rangers, (Sky Sports 4, 12.30pm); npower Championship, Derby v Leicester, (Sky Sports 2, 5pm); Primera Division, Real Madrid v Real Mallorca, (Sky Sports 1, 6.55pm); Serie A, Bologna v Juventus, (ESPN, 7.45pm). Basketball: NBA, Toronto Raptors v Miami Heat and Los Angeles Clippers v New York Knicks, (Sky Sports 4 from 5pm). Cricket: ODI, South Africa v Pakistan, (Sky Sports 3, 7.55am); Test, New Zealand v England, (Sky Sports 1, 9pm); India v Australia, (Sky Sports 2, 3.55am). Cycling: Milan-San Remo, (Eurosport, 1.30pm). GAA: All-Ireland Club SFC final, Ballymun Kickhams v St Brigid’s, (TG4, 3.45pm); All-Ireland Club SHC final, Kilcormac-Killoughey v St Thomas, (TG4, 2pm); League Sunday, (RTÉ Two, 8pm). Golf: European Tour, Avantha Masters, (Sky Sports 4, 6.30am); PGA Tour, Tampa Bay Championship, (Sky Sports 3, 5pm). Rugby: Women’s 6 Nations, Italy v Ireland, (RTÉ 2, 1.45pm); Anglo-Welsh Cup, Harlequins or Bath v Sale or Saracens, (Sky Sports 2, 2.30pm). Football: Premier League, Sunderland v Norwich, (Sky Sports 1 1pm), Wigan v Newcastle, (Sky Sports 1, 3.30pm); Clydesdale Bank Premier League, Dundee United v Dundee, (ESPN, 11am); Serie A, Siena v Cagliari, (Setanta Sports Ireland, 11.25am), Sampdoria v Inter Milan, (Setanta Sports Ireland 1.55pm), AC Milan v Palermo, (ESPN, 2pm); Ligue 1, Toulouse v Bordeaux, (Setanta Sports Ireland, 3.55pm), St Etienne v Paris St Germain, (ESPN, 7.30pm and Setanta Sports Ireland 7.45pm); Bundesliga, Borussia Monchengladbach v Hannover, (ESPN, 4.15pm); Primera Division, Osasuna v Atletico Madrid, (Sky Sports 1, 6.30pm), Barcelona v Rayo Vallecano, (Sky Sports 1, 8pm).